This article by Karl Grossman is re-posted from CounterPunch. Fracking for gas not only uses toxic chemicals that can contaminate drinking and groundwater—it also releases substantial quantities of radioactive poison from the ground that will remain hot and deadly for thousands of years. Issuing a report yesterday exposing major radioactive impacts of hydraulic fracturing—known as fracking—was Grassroots Environmental Education, an organization in New York, where extensive fracking is proposed. The Marcellus Shale region which covers much of upstate New York is seen as loaded with gas that can be released through the fracking process. It involves injecting fluid and chemicals under high pressure to fracture shale formations and release the gas captured in them. But also released, notes the report, is radioactive material in the shale—including Radium-226 with a half-life of 1,600 years. A half-life is how long it takes for a radioactive substance to lose half its radiation. It is multiplied by between 10 and 20 to determine the “hazardous lifetime” of a radioactive material, how long it takes for it to lose its radioactivity. Thus Radium-226 remains radioactive for between 16,000 and 32,000 years. “Horizontal hydrofracking for natural gas in the Marcellus Shale region of New York State has the potential to result in the production of large amounts of waste materials containing Radium-226 and Radium-228 in both solid and liquid mediums,” states the report by E. Ivan White. For 30 years he was a staff scientist for the Congressionally-chartered National Council on Radiation Protection. 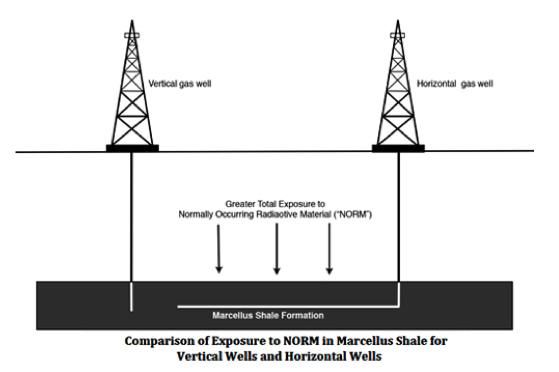 “Importantly, the type of radioactive material found in the Marcellus Shale and brought to the surface by horizontal hydrofracking is the type that is particularly long-lived, and could easily bio-accumulate over time and deliver a dangerous radiation dose to potentially millions of people long after the drilling is over,” the report goes on. 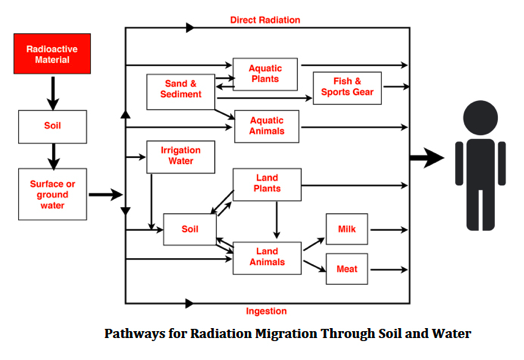 The report lays out “potential pathways of the radiation” through the air, water and soil. Through soil it would get into crops and animals eaten by people. Radium causes cancer in people largely because it is treated as calcium by the body and becomes deposited in bones. It can mutate bones cells causing cancer and also impact on bone marrow. It can cause aplastic anemia—an inability of bone marrow to produce sufficient new cells to replenish blood cells. Marie Curie, who discovered radium in 1893 and felt comfortable physically handling it, died of aplastic anemia. There are “no specific treatments for radium poisoning,” advises the Delaware Health and Social Services Division of Public Health in its information sheet on radium. When first discovered, “no one knew that it was dangerous,” it mentions. Under the fracking plan for New York State, “there are insufficient precautions for monitoring potential pathways or to even know what is being released into the environment,” it states. The prospects of unleashing, through fracking, radium, a silvery-white metal, has a parallel in the mining of uranium on the Navajo Nation. The mining began on the Navajo Nation, which encompasses parts of Arizona, New Mexico and Utah, during World War II as the Manhattan Project, the American crash program to build atomic weapons, sought uranium to fuel them. The Navajos weren’t told that mining the uranium, yellow in color, could lead to lung cancer. And lung cancer became epidemic among the miners and then spread across the Navajo Nation from piles of contaminated uranium tailings and other remnants of the mining. The Navajos gave the uranium a name: Leetso or yellow monster. Left in the ground, it would do no harm. But taken from the earth, it has caused disease. That is why the Navajo Nation outlawed uranium mining in 2005. “This legislation just chopped the legs off the uranium monster,” said Norman Brown, a Navajo leader. Similarly, radium, a silvery-white monster, must be left in the earth, not unleashed, with fracking, to inflict disease on people today and many, many generations into the future.